I'm sad to say I haven't tried this before, but after this fun little adventure I'm sure I'll be going back to pull from my deck again and again! 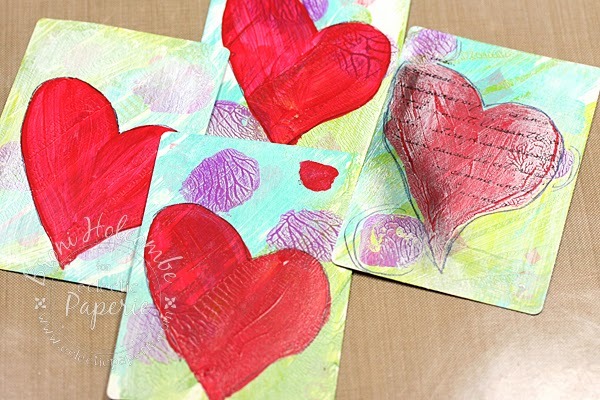 Since it's February, the month of Valentines, I decided to make Valentine altered playing cards for all my grandchildren. There are 8 altogether between George and myself. Whew! So it literally took days for this all to come together. I'm going to try to take you through a few of the steps….the ones I can remember and that I photographed! The first thing I did was sand all my cards using a sanding grip block. 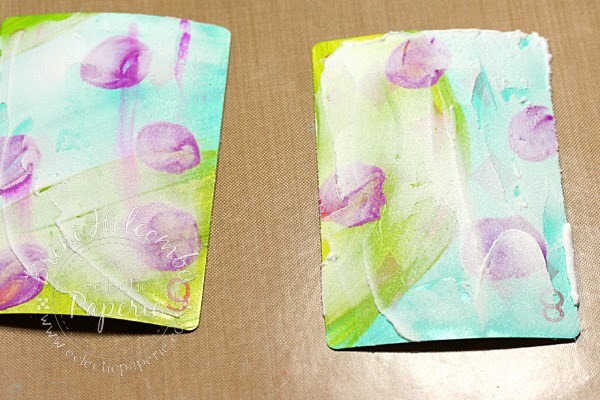 I used my Gelli plate to apply some aqua and lime acrylic paints to the cards, then I added some purple dots. Instead of using a brayer, I just used a paint brush. 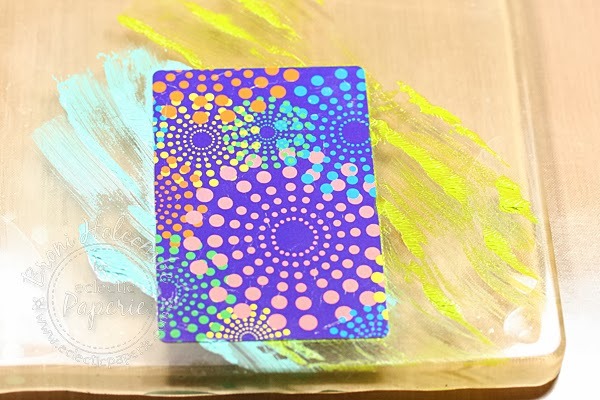 It gave more texture to the surface of the cards. 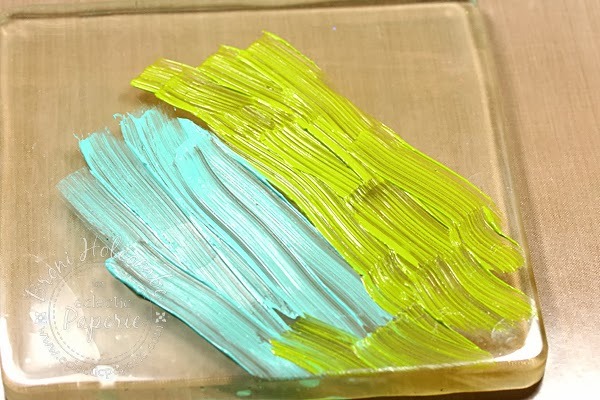 It also took longer to dry between layers. I did this with 4 of the cards. I painted over them with white acrylic paint and then wiped it off with a baby wipe. 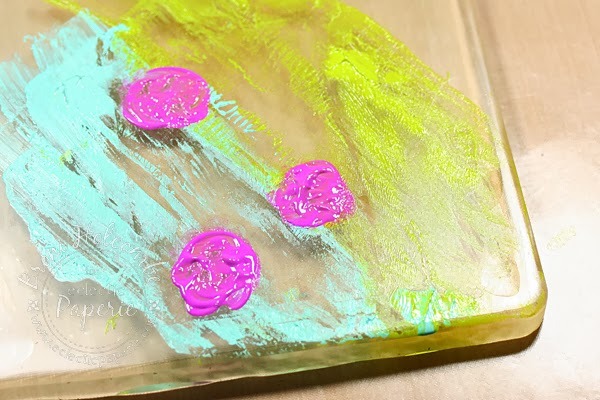 This helped the texture of the paint to show up better. 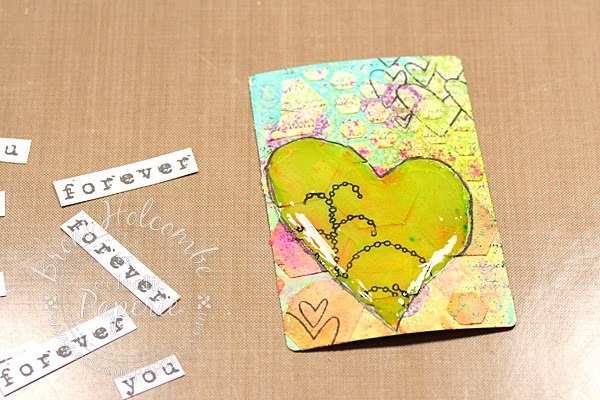 I cut a heart from a scrap of paper and used it to draw hearts onto the cards. Then I painted them with red acrylic paint. 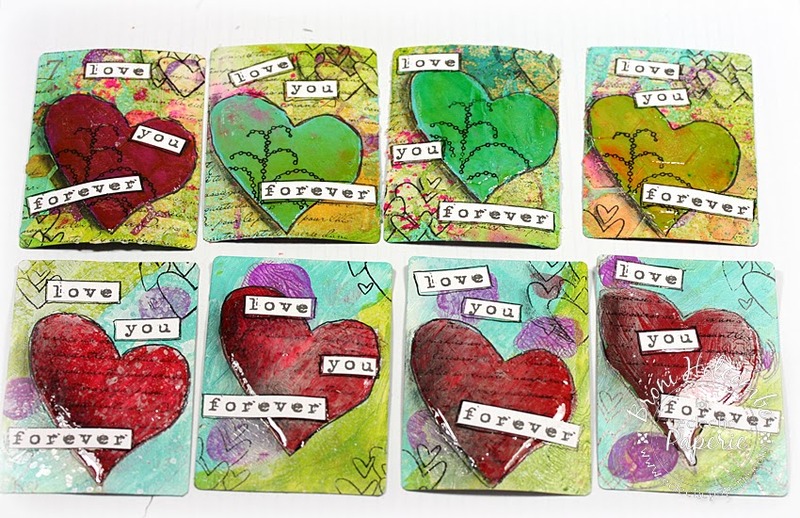 For the other 4 cards, I decided to try painting directly on the cards as opposed to using the Gelli plate. I used the same colors and also painted on the purple dots. 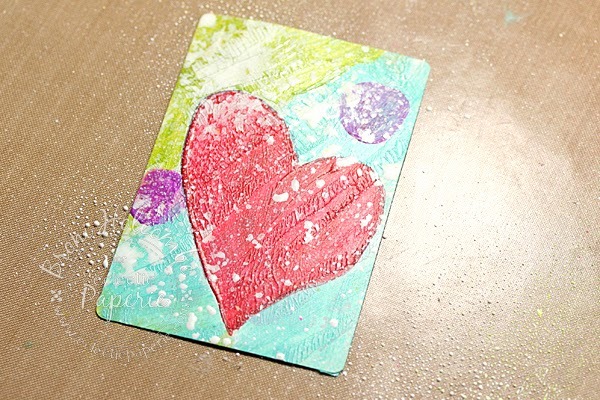 I spread some Studio 490 white embossing paste on 2 of the cards and let it dry to add some texture. 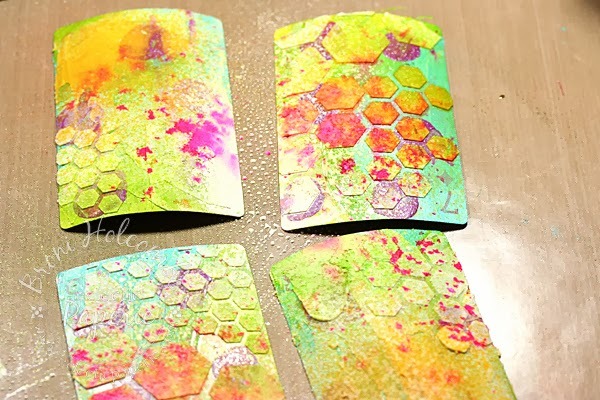 Then I put on some more embossing paste using my Mini Hexagons stencil and my palette knife. 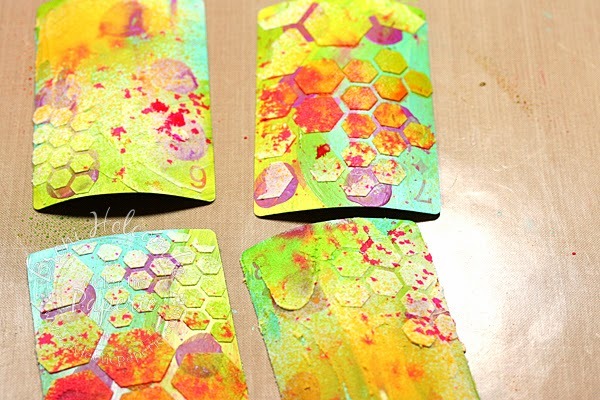 After it dried, I sprayed on several different bright Dylusions ink sprays. When they dried I sprayed just a little of the White Linen ink spray. 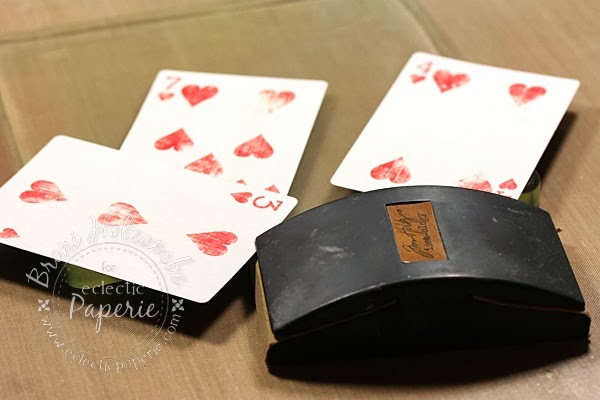 I sprayed the first 4 altered playing cards with White Linen ink spray as well. 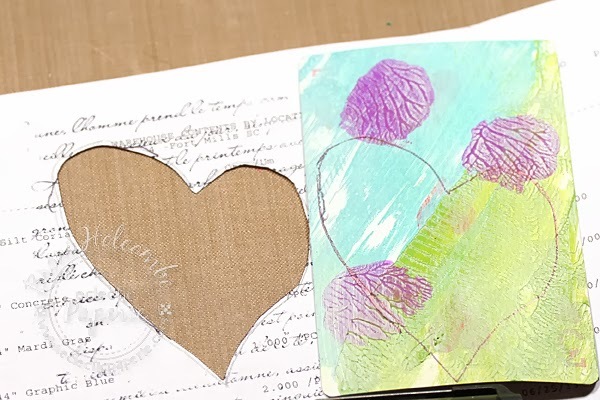 I used both pieces of my cut-out heart (the positive and the negative) as masks to stamp either onto the hearts or around the hearts. I did some more stamping on the cards using the Catherine Scanlon Random Shapes images and Archival jet black ink. 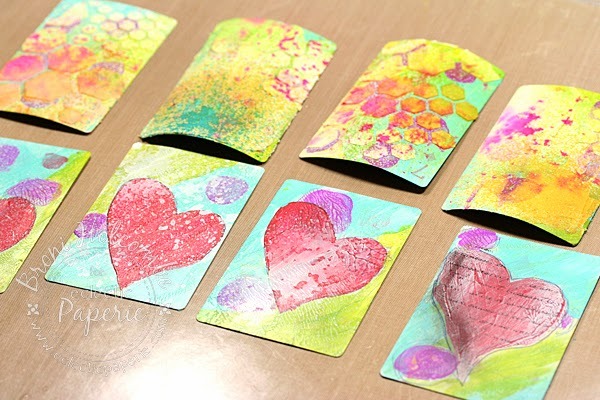 This second photo is taken from a different angle so that you can see the texture even under the Glossy Accents that I added to all the hearts. Ok then! That's my take on Altered Playing Cards. 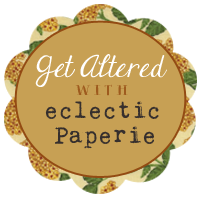 I hope you'll decide to play along with us for a chance to win a $15 gift certificate to the eclectic Paperie store! Be sure to link up below so we can all check out what you come up with! Beautiful work! Love them all. These are gorgeous, Broni. I never would have thought of using a gellyplate for the background...fabulous. 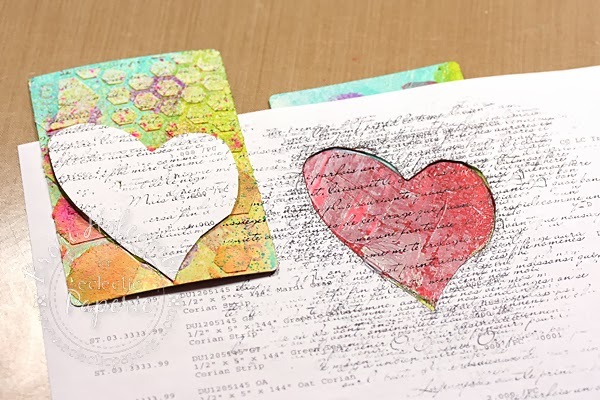 The embossing paste creates lovely texture and the shine on the hearts looks amazing and magnifies the details behind it. 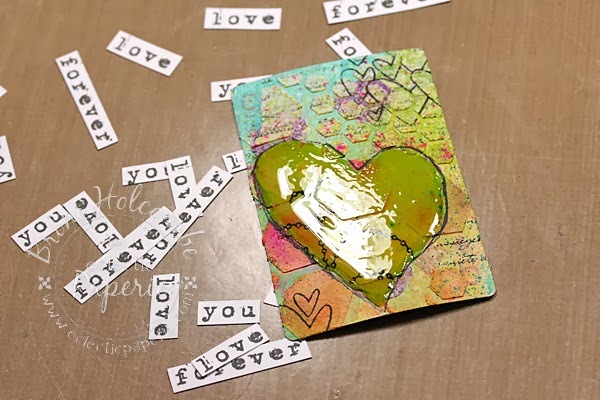 What a wonderful Valentine's card idea...lucky grandkids. Wonderful altered cards, and great challenge. Great challenge and thanks for the easy to follow directions. Love your Valentines. 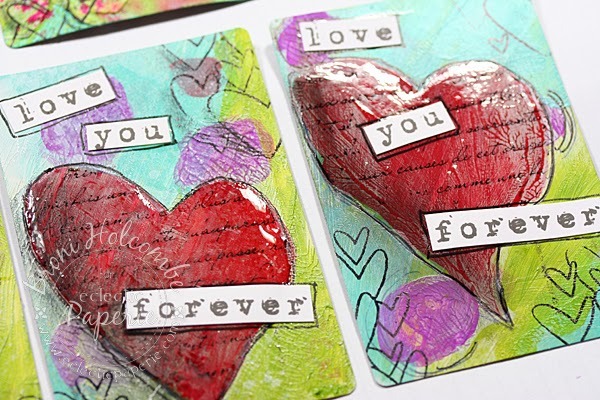 LOVE these Valentine cards, Broni! 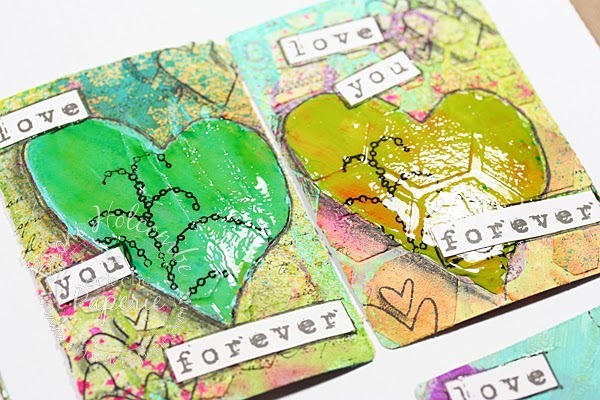 All of the different layers and colors are FAB and the glossy accents on the hearts is just the most PERFECT touch! LOVE them all! These are gorgeous. I love all the layers on there. Awesome awesome idea and beautiful cards. 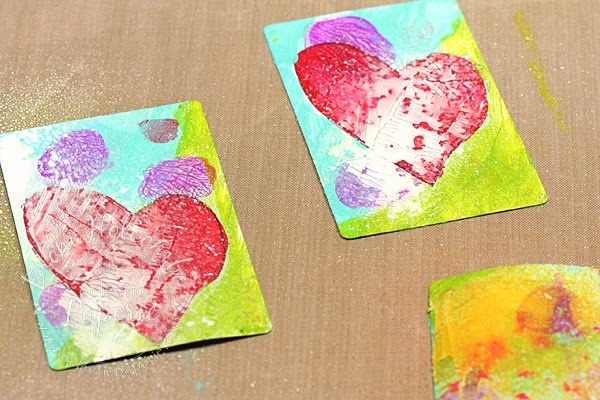 I love your colors and I totally need to remember to sand the cards first...... love this challenge. Fantastic cards! Love those backgrounds!!! Thank you so much for the fun challenge! 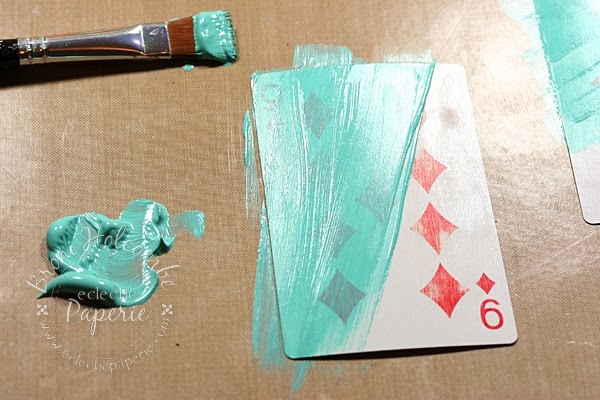 Wow, love the idea of using up old card decks. 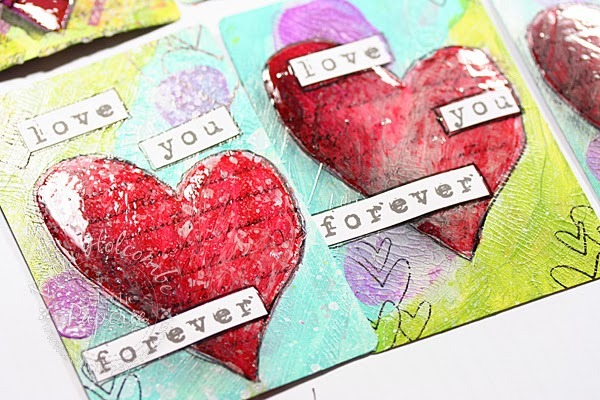 Inspirational cards which I love!!! Can't wait to play along. Who knew what you could do with csrds. Thanks Broni, this was a lot of fun and I am anxious for my gellyplate to arrive so I can give your suggestions a try. So excited to find this challenge (thanks Sue)! 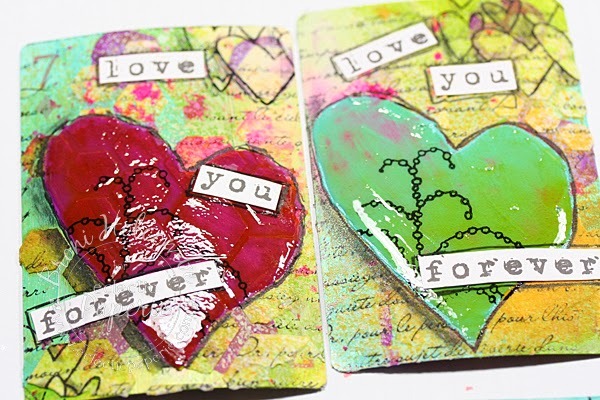 Love the dramatic alteration of your cards Broni, they are fantastic. 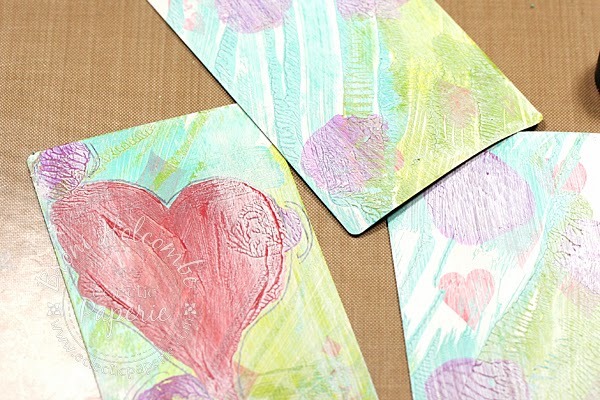 Deeeelish Broni...from cards to ART!! Gorgeous colour and texture - love, love,LOVE them!